FSX – Eagles Nest Aerodrome (FD44) located in central Florida (FL), USA is a privately owned, private use facility established November, 1985. FD44 features a 3200 x 100 ft lighted turf runway with a wind indicator. The airport lists 22 home based aircraft-20 single engine & 2 multi. FSX – H.L. Sonny Callahan Airport (4R4) also known as KCQF, located in Eastern Alabama(AL), USA is a publicly owned, public use facility. 4R4 features a 6604 x 100 ft lighted asphalt runway with a lighted wind indicator and a sunset to sunrise green-white beacon. The airport lists 39 home based aircraft – 30 single engine, 5 multi engine, 3 jet & 1 helicopter. FSX – Costin Airport (A51) located in North-West Costal Florida (FL), USA is a privately owned, public use facility established in August, 1985. A51 features a 4230 x 65 ft turf runway with a wind indicator. The airport lists 4 home based single engine aircraft. FSX – Geneva Municipal Airport (33J) located in South East Alabama (AL), USA is a publicly owned, public use facility established December, 1957. 33J features a 3998 x 100 ft lighted asphalt runway with 4-lite PAPI each end. The airport has a lighted wind indicator and a dusk to dawn white/green beacon. The airport lists 27 home based single engine aircraft. FSX – Lake City Gateway Airport (KLCQ) located in North Central Florida (FL), USA is a publicly owned, public use facility est. April, 1940. KLCQ features a 8003 x 150 ft lighted asphalt runway with 2-lite PAPI each end and a 4000 x 75 ft lighted asphalt runway in a “V” pattern. The airport has a lighted wind indicator in a lighted segmented circle and a dusk to dawn white/green beacon. The airport lists 26 home based aircraft – 21 single engine, 2 multi, 1 jet and 2 helicopters. airport lists 60 home based single engine aircraft. FSX – Wauchula Municipal Airport (KCHN), located in Central Florida (FL), USA is a publicly owned public use facility established in February, 1983. KCHN features a 4005 x 75 ft lighted asphalt runway with 4-light PAPI – both ends. The airport has a lighted wind indicator in a segmented circle and a sunset to sunrise white-green beacon. 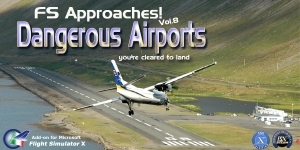 The airport lists 27 home based aircraft – 22 single engine, 4 multi engine and 1 ultralight.